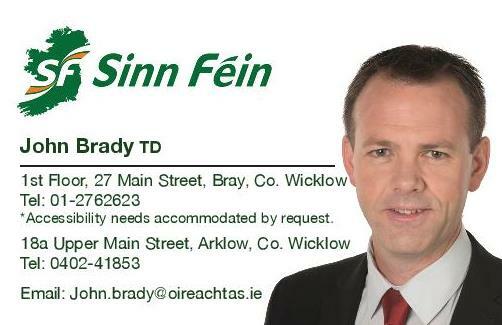 Sinn Féin TD for Wicklow/East Carlow John Brady has welcomed a long-awaited investigation into Sunbeam House Services in Wicklow which was announced by the Minister for Health this morning. “First and foremost, I welcome the announcement from Minister Harris that there will be a full and independent investigation into all complaints noted in the Jeyes Report. “I have been working with service users and their families since August, last year and given the serious concerns raised by them, I called on Minister Harris to launch an immediate full and independent investigation into the service. “Despite, the unnecessary delay until now, it was essential that Minister Harris initiated a fully independent investigation into the management and governance of Sunbeam House Service and the handling of complaints of physical, sexual and psychological abuse at the centre. “A HSE commissioned Assurance Review of Sunbeam Services had indicated 284 complaints over a two and a half year period and thirty-three serious safeguarding allegations in a ten month period in 2016. Complaints highlighted in this report included neglect and allegations of physical, sexual, psychological and financial abuse. “I have been informed that details of the investigation have been provided to the SHS Families Advocacy Group through a statement issued by Minister Harris this morning. Minister Harris has committed that the 33 safeguarding concerns in the Jeyes Report will be prioritised and rigorously investigated in full. “I understand that Deloitte will be commissioned to conduct a forensic audit of all funds and finances and the Advocacy Group will have input on the terms of reference. “The Minister has made a number of references to the involvement of the SHS Families Advocacy Group throughout this morning’s statement and their input is crucial in this investigation. Without the Advocacy Group, this long-awaited investigation would not have been announced and I commend the families who have ultimately, made this happen.